The daily German classes and of course homework have been keeping me busy. But its fun to learn something new and I am enjoying my classes. The language school has different levels for German and I plan to do at least a couple or more during our stay here. I also attempted something I've never tried before - a skirt with crochet. All my previous attempts with crochet have been simple - stoles,beanies and coasters . But being a member of some FB craft groups I happened to come across some really beautiful works and it made me want to try something different . When it comes to wearable, I am not really comfortable with the measurement part - so a crochet top was out of the question . A skirt seemed to be the safest option since there's only the waist size and length . It was a slow progress - since I ran out of threads multiple times. Luckily the store had the colors in stock. Here it is.. 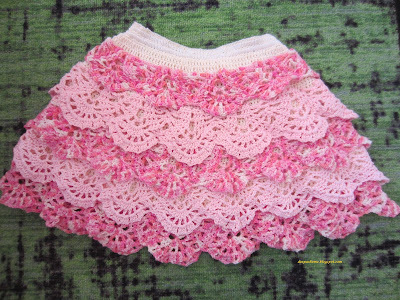 I've used three types of yarns - acrylic for the base skirt and variegated wool and cotton for the ruffles. It's quite warm ,but I am afraid the wool ruffle has made it quite heavy too. 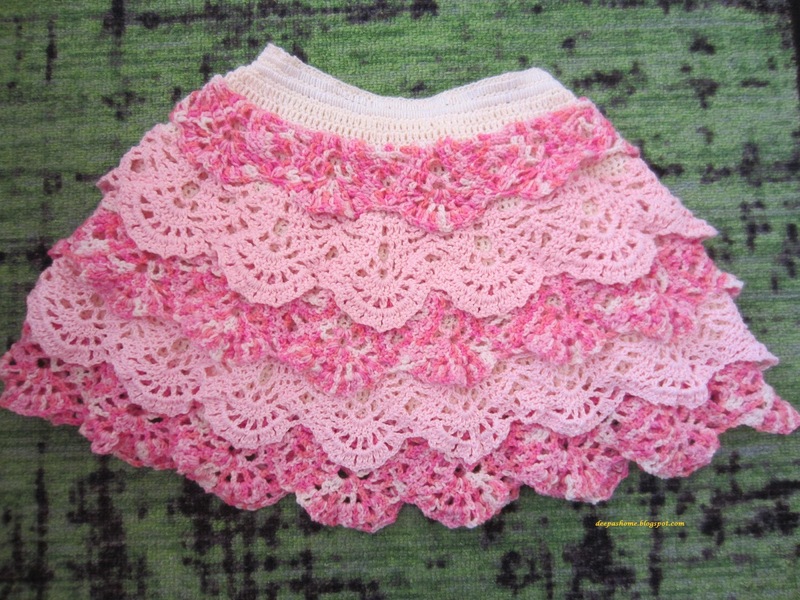 Next time(if there's one) I'll use only cotton yarn for the ruffles. The one grudge I've is that this pattern needed a lot of yarn - in fact apart from the effort I've put in to make it, I've had to spend about 15 Euros just for the yarn - that makes it a really expensive skirt!! Why do we've to spend so much to be able to create? But anyway,DD is happy, and for me its one desire fulfilled + one crafting target achieved. Of late, I've started keeping a list of what I want to do and then trying them out one by one.Trying to do things randomly seems to take me nowhere. Do you too keep a list? And that is my German kursbuch in the background. your daughter is so pretty and the skirt looks great on her. german is one difficult language to learn! Wool would be rather warm, but we're coming into winter in Europe, so maybe that is no bad thing! sounds as though your German lessons are going well. The skirt looks lovely on your DD so pretty. Happy Brazillian embroidery not fone any of that for a few years now. Gad to know that though I am 69 as I am still learing I am now 17! OMGOSH!! That skirt is so cute. I can tell your daughter likes it and it looks great on her. I know what you mean about crocheting clothes. As adept as I am at crochet, I have never attempted a fitted garment. I once wanted to learn how to knit. I had friends that knitted the best lacey clothes. But the yarn used in clothes is always too expensive for me to buy. Oh, I just remembered, I HAVE crocheted numerous baby items. I took classes in Spanish once because our area had a huge influx of Mexicans when work was booming. It's not easy to keep it up if you don't use it. Also, I found most immigrants I was exposed to were of lower education so they spoke a lot of slang which made conversing difficult for me. I'm sure you will love knowing German since you are living there. Be well...have a great week. What is your weather there now? We are heading into fall with temps in the low 60s. Cold for me, lol. Wow that's a gorgeous skirt! It's worth all the effort and time ⌚ you spent. Love the teeny weeny dress too. Very cute.